For the 1928-29 model A's with the 21" wheels. Chrome plated but made out of brass so they wont rust!. Nickel Hub Cap for the 1928-29 model A's with the 21" wheels. This cap is made from steel, as original, copper plated, polished, nickel plated and polished. Originally, nickel hub caps were used in all of 1928-29 Model A Fords. Note, these have the Ford script, but do not have the extra ring moulding at the center edge, as shown on the A-1130-BC style. This nickel plated steel hub cap was oroginally used through to about June of 1928. The face has the Ford script and "made in USA". 1928-29 Hub Cap Gasket Set, for the 21 inch Model A Ford wheels. Use these special gaskets to go between the hubcap and wheel to keep the hubcap from rattling.Sold as a set of 6 gaskets. For the 1930-31 model A's with the 19" wheels. 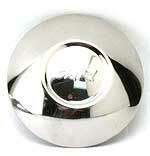 Made from stainless steel and then they're polished to a bright finish. Made in the USA. 1930-31 Hub Cap Gasket Set, for the 19 inch Model A Ford wheels. For those of you are running later V-8 wheels on your A's. These are stainless steel hub cap that fits wheels with a 5-3/4" inside hole.